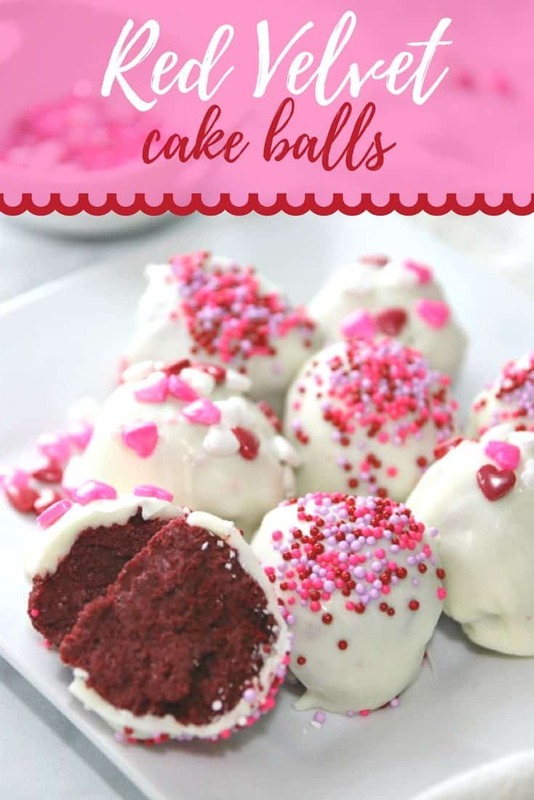 Red Velvet Cake Ball Recipe - Perfect for Valentines, Party Favors & MORE! 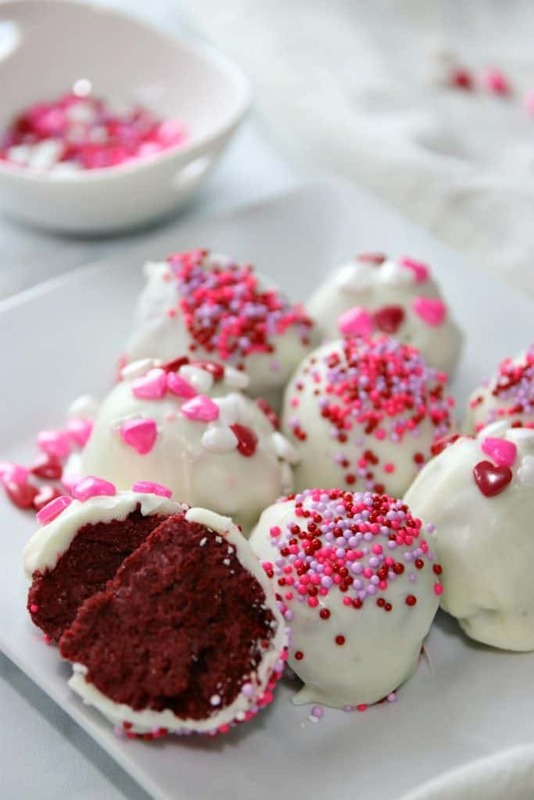 This Red Velvet Cake Ball Recipe makes a perfect treat for anytime. We recently had these for Valentines Day and they were a huge hit! I think they would be perfect for birthday parties, luncheons, party favors, a simple gift and more. 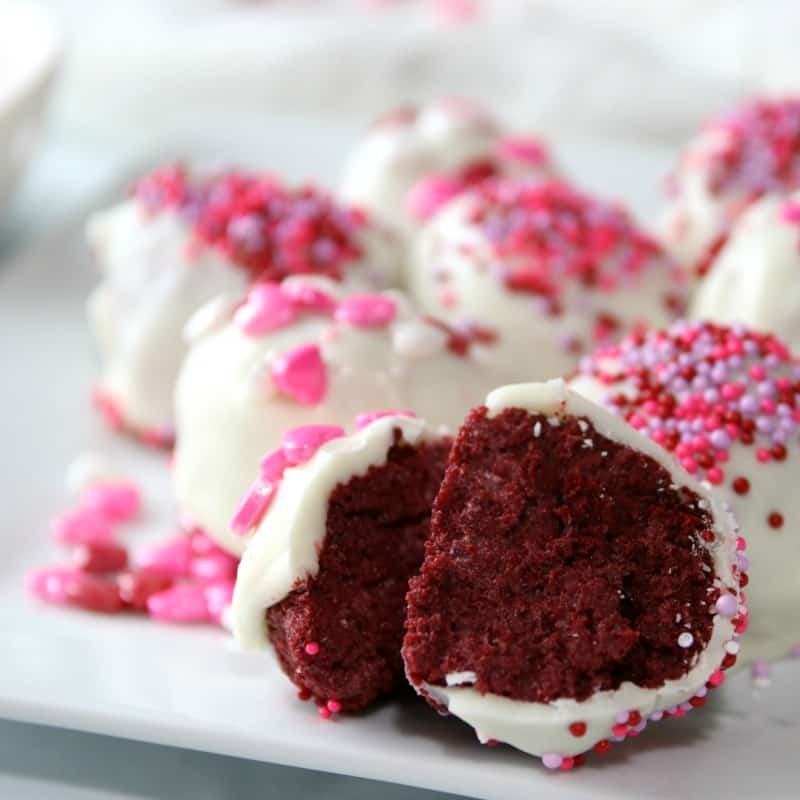 These Red Velvet Cake Balls are super easy to make and require only 6 ingredients! After you make these, you will have the basis of endless variations of decorated cake pops, cupcake pops, and cake bites. First you are going to bake the cake as directed on the box and cool completely. Once the cake is cooled, crumble cake in a mixing bowl. My kids really like to help with this step. Next you are going to mix the tub of cream cheese frosting with cake crumbles until evenly dispersed. Use a medium ice cream scoop, or your hands, to roll cake mixture into 40-50 balls. After they are all formed you are going to place balls in freezer for 45 minutes to set. <—-This step is very important so your cake balls stay together and it also makes the dipping process much easier. 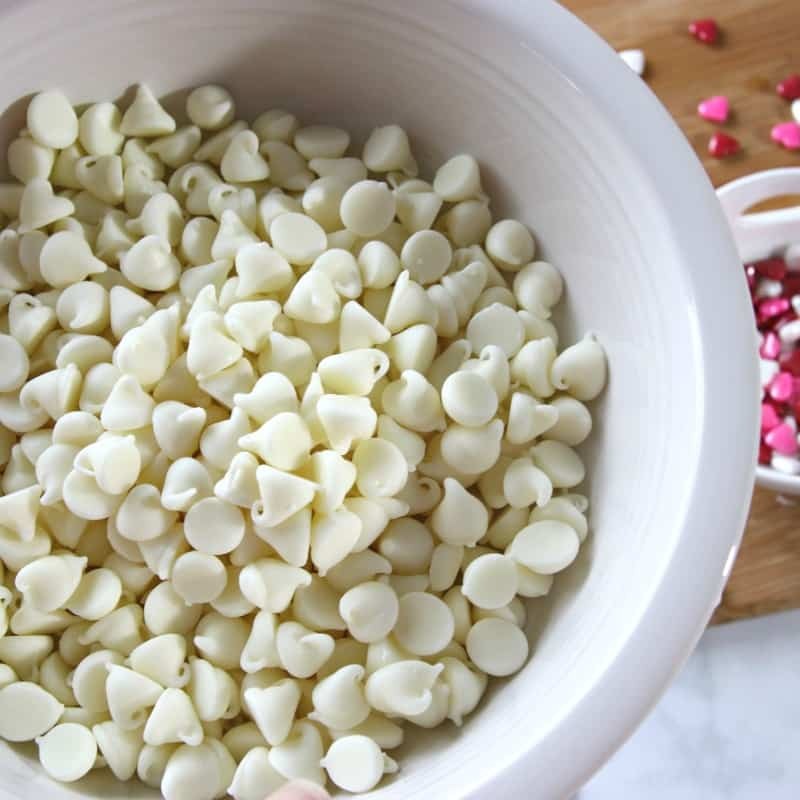 Now your going to empty the white chocolate into a bowl and microwave 30 seconds on medium heat. 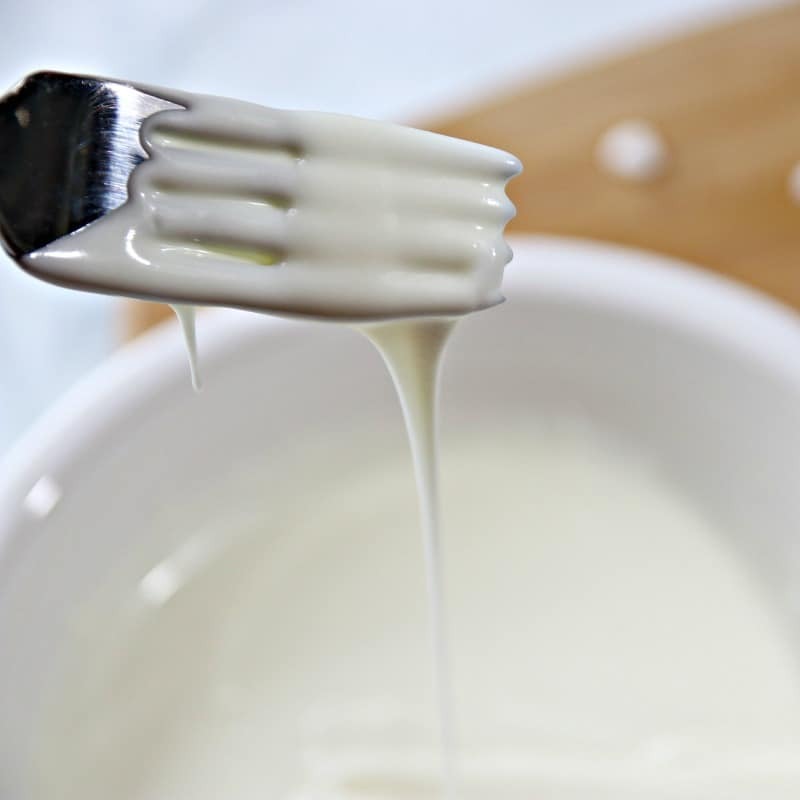 After done, stir and microwave another 20-30 seconds and stir with a spoon until smooth. Now comes the fun part! 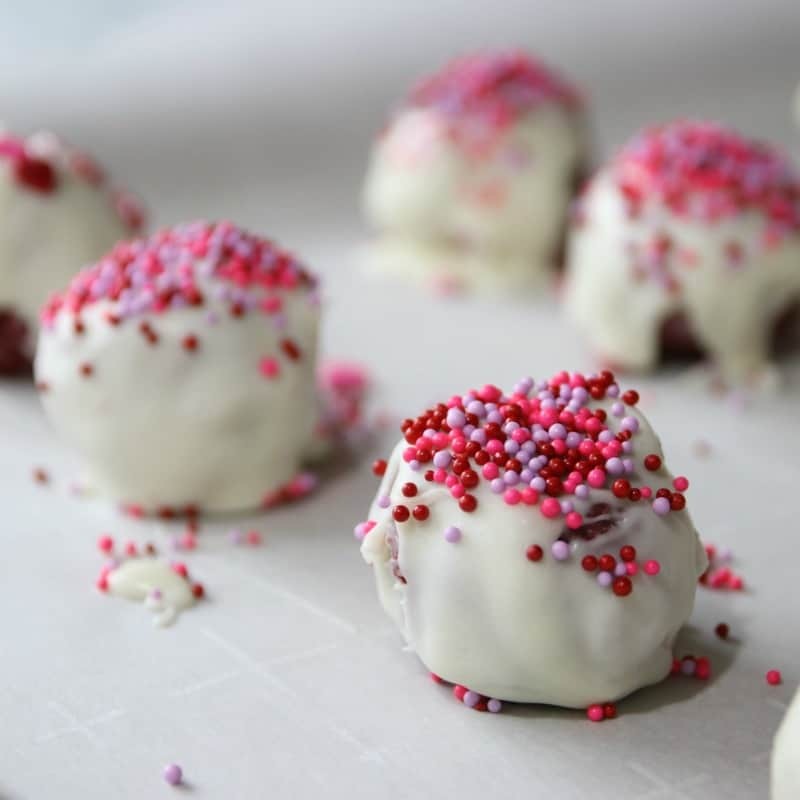 Remove cake balls from freezer. Hold a cake ball over the white chocolate bowl on a fork and drizzle the white chocolate over the cake ball then set it on a baking sheet or plate that is covered with wax paper. Sprinkle with your choice of sprinkles and/or toppings immediately as these set quickly. There are so many combinations of frosting and sprinkles you can do for any occasion. You’ll just keep repeating until all cake balls are covered and sprinkled. Enjoy! 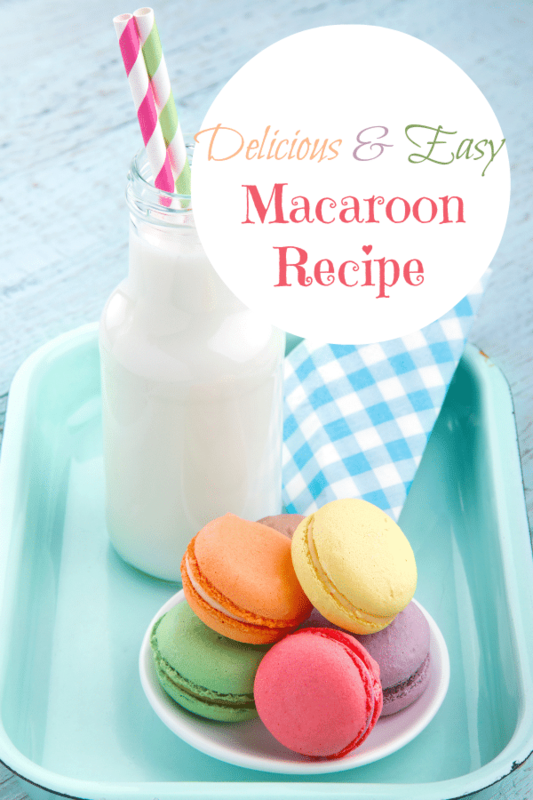 If you enjoy this Red Velvet Cake Ball Recipe, be sure to check out how to make these Easy Macarons Cookie Recipe! 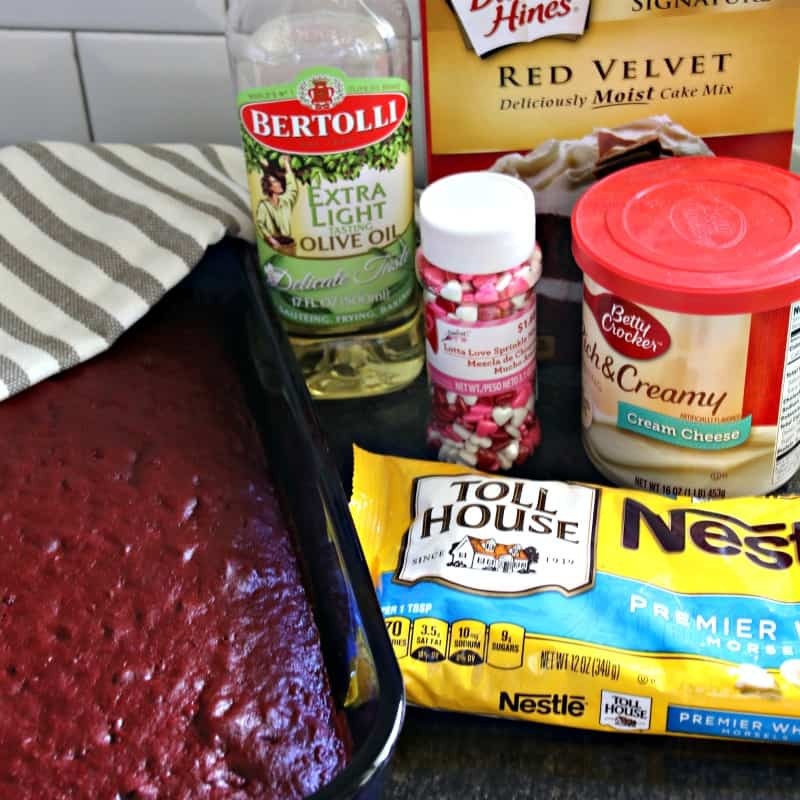 Bake cake per box instructions. Once cake is done let is cool. Once cool, crumble cake in a mixing bowl. Mix tub of cream cheese frosting with cake crumbles until evenly dispersed. 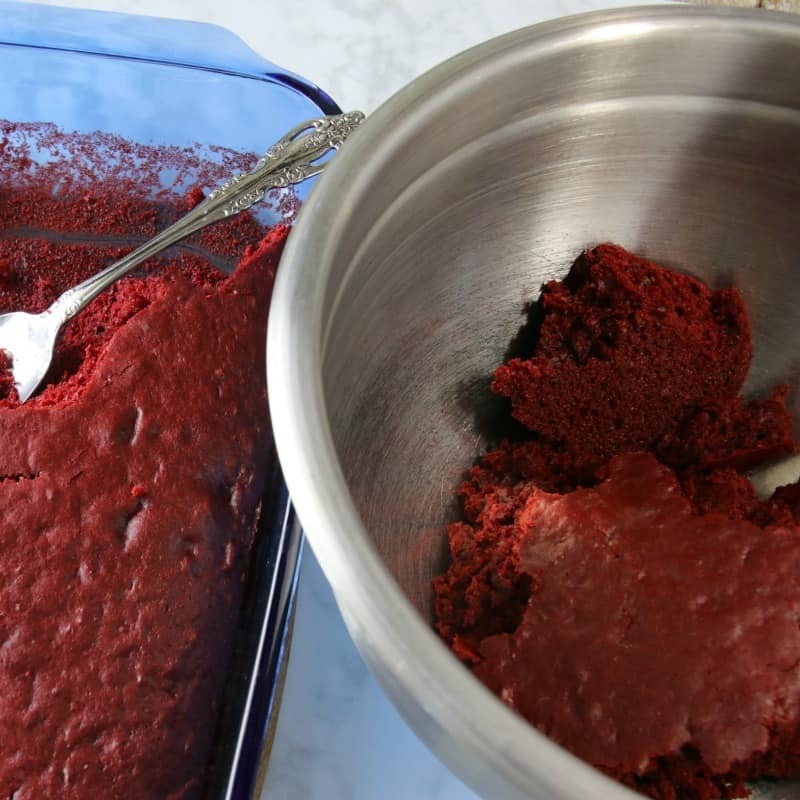 Use a medium ice cream scoop, or your hands, to roll cake mixture into 40-50 balls. 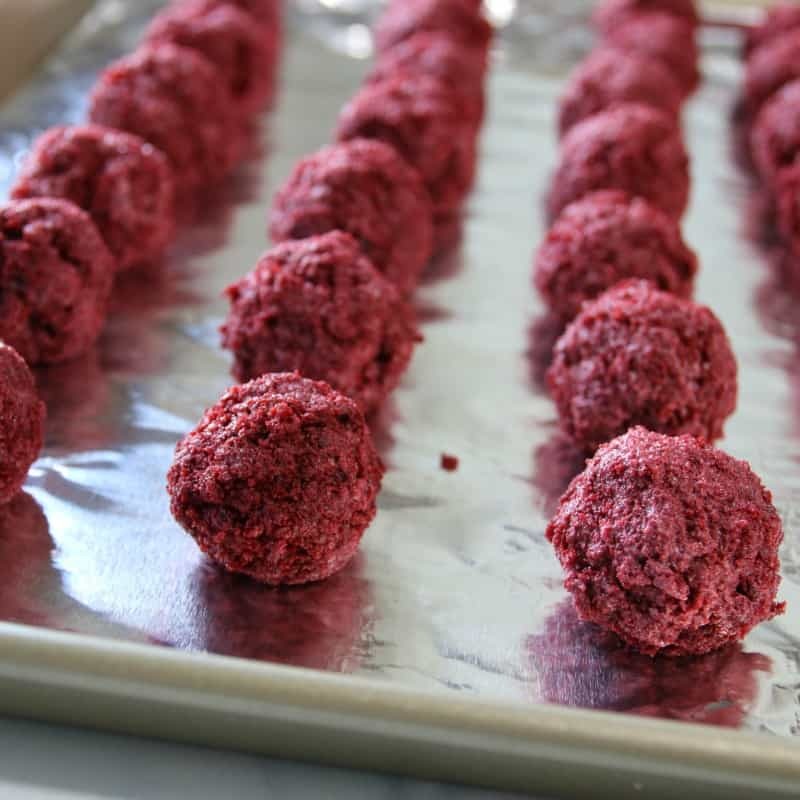 Place balls in freezer for 45 minutes to set. Remove cake balls from freezer. 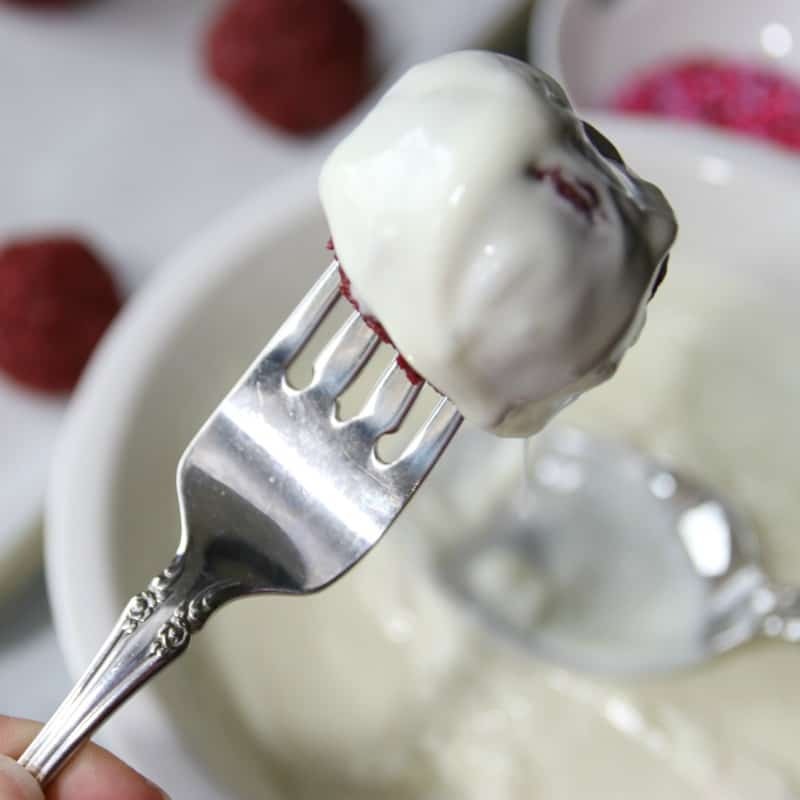 Hold a cake ball over the white chocolate bowl on a fork and drizzle the white chocolate over the cake ball then set it on a baking sheet or plate that is covered with wax paper. 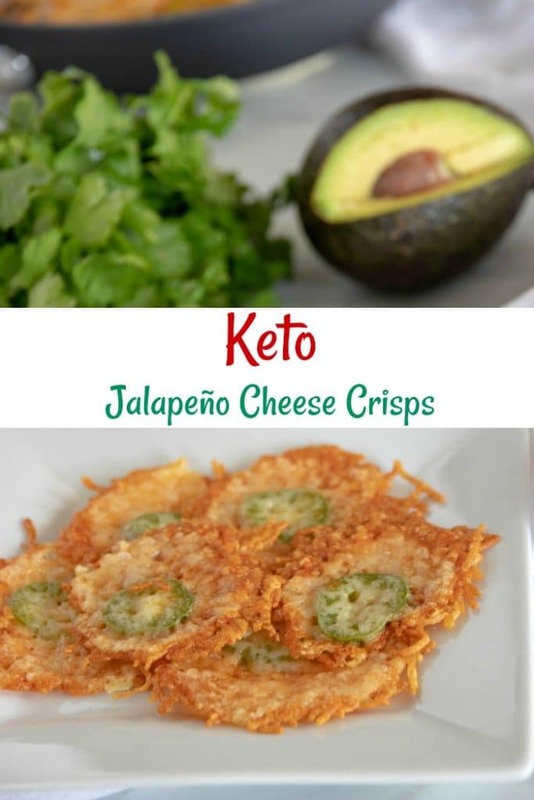 Sprinkle with your choice of sprinkles or toppings immediately as these set quickly. Repeat until all cake balls are covered and sprinkled. Enjoy.